Etched Rio Wrap. Need to wrap it up and put in the mail for mom. Runa by Gudrun Johnston. Finished the hood, using the bias bind off and overcast stitch to seam. Wish there were more specific photos in the project pages. Picked up for the button band and did ribbing. Now I am crying over TWO horrible mistakes I made. Christmas stripey socks. Using my precious Gynx yarn in the Naughty or Nice color way. Prayer Shawl #4. Unknown green acrylic yarn. Crocheting this time. Mini Mochi Fair Isle Hat by Sandi Rosner. This is my first fair isle project, but don't get to practice catching floats because there's never more than 2 stitches one color in a row. Acquisitions - Beads and findings. Hannah of Corner of Craft is an evil enabler. Followed her tutorials and now I'm addicted to making beaded stitch markers/progress keepers. Spinning Projects - Registered for Twist workshop with Maggie Casey at Estes Park Wool Market in June. Sewing Projects - Lily Pad workshop with Beth Lindquist. Started with a lap size, ended up with a queen. Layed out on design board waiting for the rows to be sewn together. Finished organizing my fabrics by type/color. Off Topic: How much of an inventory should one have when opening an Etsy shop? Advice? Watching/Listening: Hannah with the Corner of Craft podcast, Chromatic Yarns. Etched Rio Wrap for mom. Using Plymouth yarns Estilo, and it's really lovely. Stalking: Stranded color work hats. Spinning Projects - some undyed alpaca roving on the Lendrum. Silk mawatas on spindle dad made me. Sewing Projects - Made quite a few project bags, mostly Christmas fabrics. At least one will be a present for gift swap. Sewed in thread catcher and I LOVE it. Worked with my mom to make quilt for my sister. 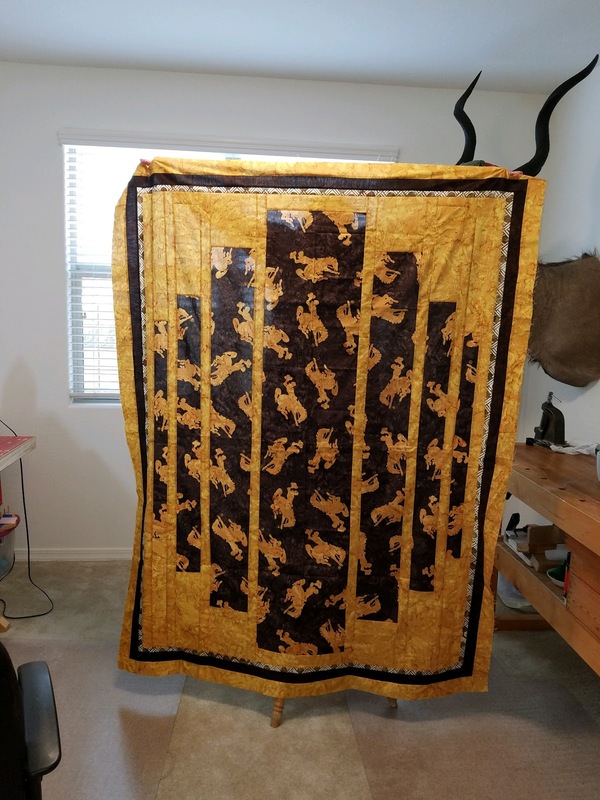 Love how it turned out and it's already out for quilting. Organizing my fabrics by type/color. About halfway through. Yes, I know I'm a nerd. Off Topic: Needed some down time after the holidays. Trying to return to/establish routine because I believe in "begin as you mean to continue." Not into resolutions because I feel it just sets me up for failure, and everyday is a new day to start something, but I do feel like this is a good time to reflect on past year, look forward to future. Watching/Listening: Football season is almost over, it's down to the playoffs. Nicole of Hue Loco. I love her attitude of helping/enabling others to expand their crafting. Vanilla socks are finished, and the same size. Prayer shawl #3 is done, and I used almost all the yarn. Evolution shawl. It only took FOUR YEARS. Almost to the day. Wash clothes for mom. She actually made a request, so of course I had to knit some. 2018 Stephen West MKAL. STILL on clue 3. Runa by Gudrun Johnston. Still on the hood. Stalking: Nothing. No new things until I've finished up some stuff. Acquisitions - Trunk show by Colorful Eclectic Yarns last weekend, walked away with a few things. Also hit Etsy hard, Lollipop and Holly Berry self-striping yarns. Sewing Projects - Working on the binding of baby quilt #1. Off Topic: Yes to Vlogmas. Watching/Listening: My favorite podcasters doing Vlogmas, and Christmas music. Tis the season! Vanilla socks are trucking along when I'm out and about. 2018 Stephen West MKAL. SPOILER ALERT!!! On clue 3, which is taking FOREVER. Spinning Projects - Fiber from Retold Yarns in There Is No Try color way. Love it. Also spun up a bobbin of mystery fiber while waiting for my singles to rest. Sewing Projects - tied a baby quilt. 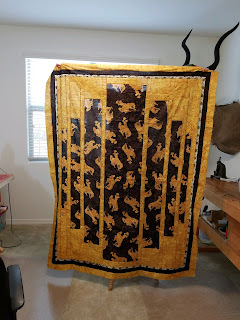 Quilt guild tonight, annual challenge reveal (8 is great) and a trunk show. Off Topic: Pigskin Party KAL with Down Cellar Studio, glad spinning counts because I'm not earning many points. Watching/Listening: Found Knitting Vicariously, with Dunderknits on YouTube. New, hope she keeps going. Episode 47: Don't Cut That! Runa by Gudrun Johnston. Finished sleeves, onto the hood. 2018 Stephen West MKAL. SPOILER ALERT!!! On clue 3, so far I've been keeping up. Evolution shawl by Rachel Henry that I started FOUR years ago. Inspired by Boston Jen to pick it up again. Love the yarn. It is intended to get more complicated with each section, and I stalled out at 6, double-sided lace knitting. Also for the DCS Pigskin Party interception, I frogged my Montego shawl, and now I've got beautiful yarn back to use as I'd like. Stalking: three color lace weight shawls, the Concrete, Potpourri, and Echoes of Color. I have 2200 yds of Silky Alpaca Lace. Poll? Sewing Projects - baby quilts! Glow in the Dark! Off Topic: Had ReStore come and haul away several large items, now it's time to clean and organize the garage. Rocky Mountain Brewery is holding an Axe-throwing pumpkin party. I have to go. Trying to do a little something every day to keep the blues away. BatterUp KAL with In A Sknit, it's time for the World Series! Pigskin Party KAL with Down Cellar Studio. Watching/Listening: Looking for some new video podcasts. Recommendations?